Summer has officially ended and we can already feel the shifting of the seasons; the leaves are changing into their spectacular autumn colors and there is a cool, crisp breeze in the air. And before we know it, winter will be here along with cold, wet weather. Just like older people, many senior horses are faced with extra challenges as they try to handle the cold weather that winter presents. Your horse’s body condition, nutrition, dental care and shelter are all issues that you’ll need to address, plus you’ll want to take care of any health or hoof care issues before winter arrives. So here are some tips to help you prepare your older horse for winter. With advances in horse care, veterinary medicine and equine nutrition, horses are now living longer, more productive lives. It’s quite common to see horses living into their 20’s and 30’s, and many horses that are still competing in shows are often in their mid to late teens. In fact, quite a few of the equestrian competitors in the 2012 Olympics were senior horses! So how do you know if your horse is a senior? It’s generally believed that a horse who is 18 to 20 years old has entered into his golden years, however, every horse ages differently and some horses age more gracefully than others. You may have a horse in his early teens who is starting to show signs of aging, or you might have a 20 year old horse who is full of energy and is still competing in shows. Some of the differences in the aging process may be influenced by genetics, breed, veterinary care and also the type of work they were performing in their younger years. To get a better idea of how old your horse is compared to human years, you can figure that after a horse reaches age four, one year of a horse’s life is approximately equal to 2.5 human years (before age 4, the rate is 6.5 years for each human year). Does your horse need Joint Support? No matter what your horse’s chronological age is, you will probably see some physical changes in your horse as he starts to get older. Some of the typical signs of an older horse include joint stiffness, difficulty maintaining his weight and possible decreased immune response. You’ll also notice that your aging horse is losing his muscle tone, and he might have a shift in weight distribution (such as fat deposits in some areas while other parts of his body appear thin). Your horse’s face will also change as he gets older – the “hollows” above his eyes will deepen and you might also notice a slight drooping of his lower lip. His hair coat will probably also change, and his coat may appear dull or he may not shed out evenly. Once you start to see these signs indicating that your horse is entering his senior years, you can help prepare your older horse for winter by making some changes in his health care, diet and environment. As your horse begins to get older, one of the first things you’ll probably notice is gradual weight loss. Your round, physically fit horse who had always been an easy keeper may start to get a little thin, usually with his ribs and hips becoming more prominent and visible. Some of the weight changes you’re seeing could actually be a shift in the distribution of his body mass as he starts to lose muscle tone as part of the normal aging process. Weight changes can also be especially pronounced if your horse is developing a sway back (lordosis) and his belly is beginning to sag. Or it could be that he really is losing weight possibly due to dental problems, reduced digestive efficiency or dietary issues. Keeping your horse at a healthy weight is something that you’re going to want to address early on as you prepare your older horse for winter. Of course, if you notice that your horse is noticeably dropping weight quickly, you will need to have him examined by your veterinarian for any possible underlying medical issues. Weight gain, on the other hand, may happen to older horses especially if they have recently retired from competition and are still consuming the same amount of food as when they were in training. Extra weight on your older horse can put additional strain and stress on his bones and joints and may aggravate already existing conditions such as arthritis. So while you want your senior horse to maintain a healthy weight, especially during the winter time, if your horse is overweight then you’ll need to balance his food intake with the amount of exercise and turn out that he’s receiving. The best way to assess the weight of your horse is to use your hands to evaluate his body condition score (BCS). You can move your fingers through his coat and feel for fat across his neck, ribs, hips, over his back, along his withers and behind his shoulders. Ideally you should be able to feel your horse’s ribs if you apply a little pressure across his rib cage, but you will also want your senior horse to have a light layer of fatty insulation as we approach the winter season. During the winter when it’s too cold and wet to ride, you can use this free time to periodically reassess your horse’s body condition. By then your horse will have a thick winter coat which can cover up weight loss, so this is a great time to groom your horse, feel under his winter coat and see how he’s holding up in the cold weather. This quick grooming session will not only help you identify any winter weight loss, but it will also let you look for any superficial wounds or skin and coat issues that need to be addressed. You can refer to this Body Condition Score (BCS) chart to help you evaluate the condition of your horse’s weight, and you can also have your veterinarian help you assess your horse’s weight. Horses that have a BCS of 5 or greater will have some extra fat that can help provide insulation during the winter, while horses that have a BCS below 5 will need some extra calories to help stay warm during the winter. If you need to give your horse extra food so he can put on some extra weight, you’ll want to slowly increase his feed rations so as to avoid digestive upsets. One of the biggest challenges that your older horse will probably face will be dental problems, which can pose a variety of health related problems including weight loss, tooth decay/infection or choke. Horses chew in a circular motion and over the course of his lifetime, this motion will gradually wear down his teeth, especially the center part of his molars. Depending on your horse’s age, eating habits and diet, he may just partially wear down his teeth or he may wear them down all the way to the root. If his teeth are worn to the root level, he probably won’t be able to effectively chew and digest most common equine feeds such as hay, grass or grain. As your horse’s molars begin to wear down, sharp points on the outside of both the upper and lower molars can develop. These sharp points (called dental hooks) can cause discomfort or pain, so regular dental care is important to allow your horse to comfortably eat and properly chew his food. Also, your horse’s molars will wear unevenly as he begins to lose some of his teeth from age and his bite will become progressively less even; this will eventually affect the way that he chews his food. Another common dental problem seen in older horses is that his incisors (which he uses to tear grass from the ground) will start to become more sloped and eventually these teeth will become less and less effective. If your horse’s teeth are in poor condition, he is going to have difficulty thoroughly chewing his food which could put him at risk for choke or even colic. Horses with dental problems usually chew some of their food and then spit out the remaining pieces in a process that is commonly called quidding. 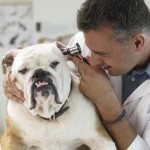 This is a clear sign that you should call your veterinarian for a checkup! Talk to your vet about setting up regularly scheduled dental exams for your horse – many recommend that your vet examine your older horse’s teeth at least twice a year. Regular dental checkups can quickly detect dental problems that your horse may be experiencing. Your vet will be able to find an abscessed or broken tooth, or float his teeth to remove sharp points on his premolars and molars which will help your horse properly chew and digest his food. You can then work with your vet to develop a customized feeding program that best fits the needs of your older horse. Now is a perfect time to reevaluate your senior horse’s feeding program and you can work with your vet or equine nutritionist to see if you need to make any changes to his feeding program. This is especially important to take care of before winter arrives with cold rain, wet snow and below freezing temperatures. Your horse is going to need to consume extra energy in order to maintain his core body temperature, so you’ll need to evaluate and come up with a feeding plan that can meet these increased demands. The nutritional needs of senior horses is going to vary greatly from one individual to the next; some older horses digest their food just as well as they did when they were younger, while other horses will need a special diet to help them maintain good health and body condition. You may find that the diet that you were feeding your horse last year is working just fine and your horse’s weight is perfect for his size. Or you may find that his current diet is not meeting his needs as he gets older, especially during the wintertime. Some studies suggest that the effectiveness of the intestinal lining can decrease as horses get older, which will make it difficult for nutrients to pass into the blood stream. Hormonal and metabolic changes can also influence the horse’s ability to digest and absorb nutrients provided in their feed. These horses will need to have their diets reevaluated and changed. The main criteria you will want to look for is feed that is easy to chew and swallow, is highly palatable and is also clean and free of dust or foreign material. Also, any changes that you make to your horse’s diet should be made gradually over time. Typically, a horse should eat one to two percent of his body weight in hay (forage) every day. During the winter time, however, your horse is going to require more energy to keep warm and you’ll need to increase the amount that you feed (up to 25% more) in order for him to maintain his weight when the temperatures drop. If your older horse is able to easily eat hay, you can try increasing the amount of hay you give him each day. Some types of hay are higher in calories than others, so you’ll want to see what is available in your area. If your horse is having trouble chewing hay, you can slowly transition him to either hay cubes or pellets. If you find that the hay cubes are too hard for your horse to eat, you can first soak them in water which will help soften the cubes. Another option for horses that have problems chewing is to add enough water to make a “slurry”, which is a soup-like consistency that your horse can easily drink. Not only will this help your horse eat his food, it will also get some extra water into him and additionally reduce the chance of choke. Another great choice for older horses is senior horse feed that has been specially formulated to address the nutritional needs of older horses. Many of the senior feeds contain hay (fiber) in addition to concentrates, providing extra calories in the form of fat from flax seed, rice bran and/or vegetable oil. Senior feeds are soft, easy to chew and digest, and are highly palatable even to picky eaters. Ideally, as you adjust the feeding schedule for your senior horse, you’ll want to provide smaller meals more frequently during the day so as not to upset his digestive system. Full time retirement might sound like a good idea to us, but keeping your senior horse physically active is actually one of the best things you can do for him. Whether your horse lives in a stall or in a pasture, daily exercise will help keep him in better physical and mental condition. If you are still able to ride him, try your best to take him out for short rides during the winter. Light exercise, such as trail riding or light schooling will help keep his muscles, tendons and joint capsules limber and free moving; of course you’ll want to spend some extra time warming him up and cooling him down. If you’re not able to take him out for rides, you can still do some stretching exercises with neck and leg bends to help keep him limber. You can take carrots or other treats and hold them off to his side, which will easily encourage your horse to stretch and bend both his neck and his head. As your horse gets older, you’ll probably start to see signs of arthritis. Arthritis is a broad term used to describe joint pain or joint disease, specifically the inflammation and/or deterioration of the joints usually caused by long term wear and tear. Physical signs of arthritis can include swollen joints, stiffness and difficulty getting up and down. And just like with people, these signs will become more pronounced during the cold, wet winter weather. The best thing you can do for your horse if he’s showing signs of joint stiffness or arthritis is to allow him to exercise at will, ideally in a turn out pen or fenced pasture area. His stall should have suitable bedding such as a rubber stall mat with soft shavings, which can cushion him should he fall down, and can also provide traction for when he gets up. A small stall is not good for senior horses with arthritis, since they could become trapped if they fall down. 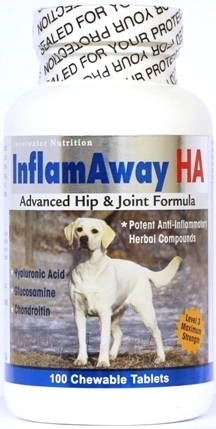 You can also help your senior horse by giving him joint supplements daily, such as InflamAway HA-200 or the economical InflamAway EQ. These supplements have Hyaluronic Acid, Glucosamine HCl, MSM, Chondroitin Sulfate and yucca – all which may have beneficial effects for horses with joint stiffness. So while we cannot reverse the aging process in our older horses, we can at least provide some relief to help them stay comfortable during the winter. As you prepare your older horse for winter, you’re going want to address any hoof issues that your horse may have. As your horse gets older and is ridden less (or not at all), he may develop poor hoof growth or imbalanced, uneven hooves especially if he has arthritis and is not moving correctly. Even though your horse is not working or performing like he was in his younger years, he is still going to need regular scheduled farrier visits and everyday hoof care during the winter. You might consider pulling his shoes to prevent slipping on winter ice, depending on the weather conditions in your area. You’ll also want to clean his feet daily to avoid ice accumulation (“snowballs”) which can cause sole bruising and soreness. You also may start to notice that your senior horse is having trouble balancing on three legs or may experience leg pain when his feet are lifted up and his joints are flexed. Your older horse will greatly appreciate it if you give him frequent breaks and rest with all four feet on the ground during the farrier visits. Older horses face naturally occurring changes to their immune system, so it’s important to keep an eye out for signs of health problems. Senior horses are more prone to illness and heal slower from injuries, so it’s a good idea to have your veterinarian examine your senior horse and make sure he’s up to date on his vaccinations, especially before winter sets in. Your vet can also check for tumors, hormone imbalances, Cushing’s disease, arthritis and other health issues often seen in senior horses. You’ll also want to keep up with his regular deworming program, even through the winter time. During the winter, your horse is going to need a covered shelter where he can escape from the cold wind and wet weather. Your horse may start having difficulty staying warm in the cold weather as he gets older, so you may need to start blanketing him when the temperatures drop. If you do end up blanketing your horse, you’ll want to check him several times during the day to make sure that he’s not overheating and also check that the blanket is not rubbing him and is securely in place. It’s important to choose a blanket that fits your horse well. Older horses typically do well with companionship, either an older horse or a friendly pasture mate, so hopefully you are able to find a friend for your horse such as another older horse, a donkey or even a goat. Older horses usually fall to the bottom of the pecking order and will not fight for food or water, so find a place where he can eat and drink in peace and will not have to compete for food. Taking care of your older horse may require some extra steps, especially as you prepare for the winter, but with these simple adjustments your senior horse will have an easier time during the cold weather season. Very informative. Thank you. Where can u get the joint supplement you mentioned? Thank you for your interest; glad you enjoyed the article! You can get our equine joint supplements on our website. 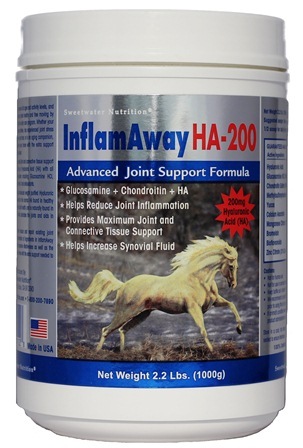 InflamAway HA-200 can be found here https://www.sweetwaternutrition.com/inflamaway-ha-200/ or if you are interested in InflamAway EQ, here is the link: https://www.sweetwaternutrition.com/inflamaway-eq/ Use coupon code NEW for a 10% discount. Thank you again for your comments. Thank you so much for your post it helps new horse owner like myself tremendously.